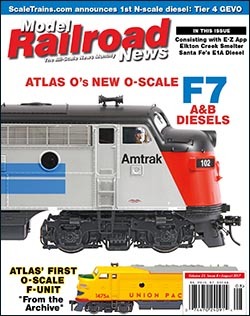 Athearn, through its Genesis line, recently introduced an HO-scale model of the “new image” Illinois Central (IC) Phase I GP38-2 with four different road numbers and unit-specific details. The IC road numbers offered are 9611, 9612, 9617, and 9619, which are all available with standard DC or a Digital Command Control (DCC) Tsunami2 dual-mode sound decoder. The Athearn Genesis model “new image” IC GP38-2 9612 and 9617 have Operation Lifesaver graphics applied to the long hood. 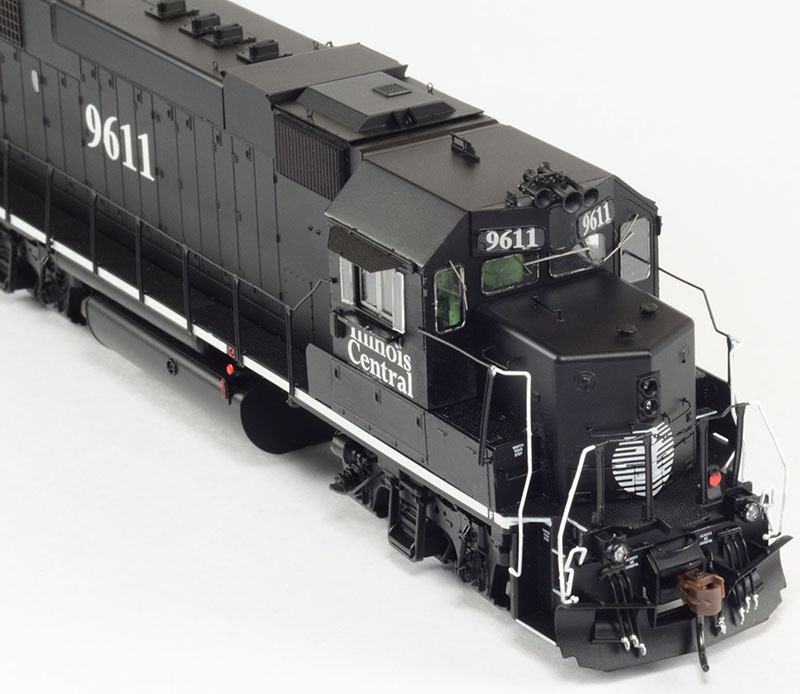 The focus of this review is the Illinois Central Phase I GP38-2 painted in the basic black “new image” or “Death Star” scheme. When I began researching information for this review of Athearn’s Genesis release, I quickly found that I needed to provide a historical outline. Information was necessary to help the reader understand the significance of the prototype “new image” IC GP38-2s. The Illinois Central Gulf Railroad was created during challenging economic times, when Illinois Central and Gulf, Mobile & Ohio (GM&O) merged on August 10, 1972. Formed with the hope that the merger could produce significant savings and increased profits through consolidations of terminals and train operations, efficient use of assets, and abandonment of redundant trackage, managers quickly faced innumerable obstacles to increased efficiency and adequate profits. At the time of the merger, the diesel fleets of both railroads needed replacement. GM&O had many aging Alco switchers and road switchers, and IC had many Electro-Motive Division (EMD) GP7 and GP9 diesels that either had to be upgraded to modern standards or traded in on new units. GM&O had aggressively acquired modern power in the 1960s, purchasing GP30s, GP35s, and SD40s. In 1969, GM&O discovered the ideal units for its operating needs: EMD’s GP38 model. By the time of the merger, it had acquired 33 GP38/GP38ACs and 15 GP38-2s. Although Illinois Central had purchased 19 GP38s, it also acquired 75 GP40s for service on intermodal and manifest freights. ICG did not purchase many new diesel locomotives, opting to remanufacture several hundred GP7s and GP9s into the GP8, GP10, and GP11 models at its Paducah, Kentucky, shops. However, ICG did purchase 40 GP38-2s (9600-9639) in 1974 from EMD, which was the largest order for new locomotives in that road’s short history. Ideally suited to the diverse needs of the road, the new GP38-2s worked in every class of service, from locals to intermodals and coal trains to manifests. Although they tended to stay on the north end of the system, at one time railfans could find GP38-2s on almost any line the ICG operated, from Iowa through Louisiana. The Athearn Genesis “new image” IC Phase I GP38-2 9611 has the correct coupler cut levers and the correct “ALWAYS BE CAREFUL” and “WATCH YOUR STEP” stencils in the proper locations. The round vents on the nose are in the appropriate locations, and the step edges are painted white, which was true to the prototype. The circular “Death Star” logo is an excellent rendering of the prototype logo and is in the proper place on the nose below the front nose headlight. The upper headlight was plated over on the prototype, and this is accurately depicted on the model. The unit has plastic inserts for the window glazing and a detailed cab interior. The color of the cab interior is the correct green, making this a nice additional detail. The 1974 order for 40 GP38-2s came from EMD in the road’s orange-and-white ICG scheme — a variation on a new look for the IC that came into being in 1967. During the tenure with ICG, only a handful of the GP38-2s received repainting into the ICG gray-and-orange scheme introduced around 1980. The units came equipped with the standard 645-series normally aspirated 2,000-hp prime mover and a single control stand and lacked dynamic brakes. These GP38-2s included a 2,600-gallon fuel tank and special “switcher steps,” which allowed the brakemen more room to maneuver within the confines of the step area. The units were also delivered with a rare headlight arrangement with three lights in a vertical pattern located on the front of the cab between the number boards. The bottom light of the three was red. Another interesting detail of the 9600-class GP38-2s was the split, L-shaped fold-up door configuration located in the area of the non-dynamic brake sheet steel on the roof. This was comprised of four power assembly access doors, which allowed the removal of the entire non-dynamic hatch during replacement of the power assemblies. The ICG did not last long, only 188 months to be exact. ICG’s existence was marked by deferred maintenance, strict labor laws, and the ever-changing political and economic environments in which it operated. After several attempts to find potential merger partners, the railroad was sold in sections, reducing its core system to 2,900 miles from its original 9,658 miles on start-up in 1972. In the 1980s, ICG sold off large portions of its main lines to regional operators such as Chicago Central & Pacific (Chicago to Omaha/Sioux City); Chicago, Missouri & Western (Chicago to Kansas City/East St. Louis); and MidSouth (multiple lines in Mississippi). Although ICG sold many if its rebuilt GP8s and GP10s to these new roads, it kept all of its GP38-2s in its locomotive fleet. Following this corporate sale of many of its lines, management decided to revive the original Illinois Central name in late 1987. The “new image” IC was a lean system as it entered the decade of the 1990s. The new IC ambitiously single-tracked the Chicago-New Orleans main line, abandoned several lightly used branch lines, and greatly reduced the number of out-of-service diesel locomotives and freight cars sidelined years earlier. With this attitude came a new corporate image that revived the basic IC-black paint scheme to its locomotives. This new approach also brought about a new company herald, which railfans widely criticized, giving the new icon nicknames like “Death Star” and “AT&T” logo. The new IC was unable to use its original “Green Diamond” herald because it was included in the sale of assets. Chicago Central & Pacific (CC&P) was the new owner of the IC herald design as of 1985. 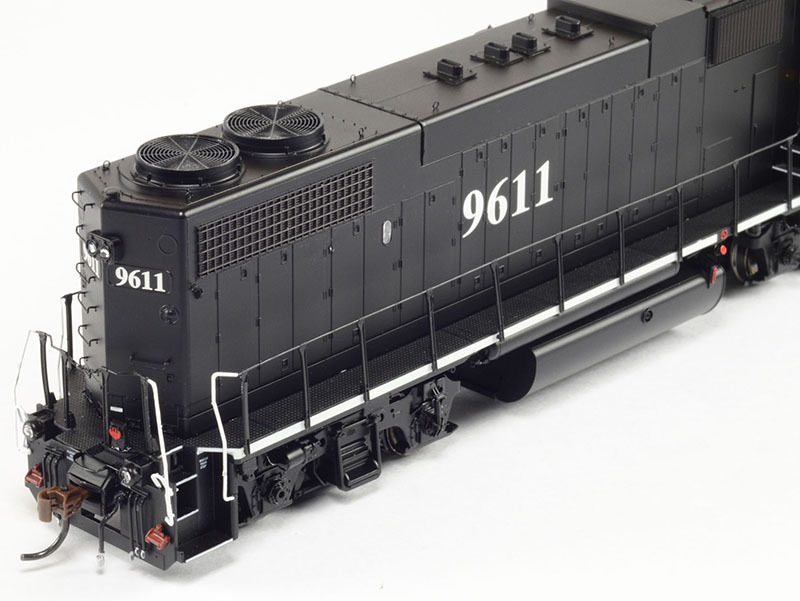 MRN’s sample Illinois Central Phase I GP38-2 road number 9611 includes several exceptional qualities one would expect from an Athearn Genesis HO model. The black paint and printing are evenly applied with the Illinois Central name spelled out in white on the cab sides and the “Death Star” herald on the nose. The road name is in the proper typeface, and the herald was well executed and is correctly placed according to online photos and photos contained in this reviewer’s collection. The road number is the correct typeface and appears properly placed on the sides of the long hood. The number boards are well executed with the numbers in white on a black background, which is accurate for the prototype. The frame stripe is white and looks to be accurate. However, I did discover that the original “new image” painted units had a thicker frame stripe, which was painted onto the side sill wrapping around the front and rear of the units. On units receiving repainting in the mid-1990s, the stripe is a thinner band made of 3M’s Scotchlite reflective material. The MRN sample IC 9611 has a thin frame stripe, which denotes it as being repainted in the mid-1990s, according to my research. The step edges are correctly painted white, as are the vertical handrails, which crews used to navigate the steps. The step edges leading up to the cab are painted white on the model. However, it was not clear in any of the photos I had of 9611 that showed all the step edges painted white at these locations. The fireman’s side of the model accurately includes a bell and bracket on the side of the carbody, and the top of the long hood had the four-exhaust manifold, which was true to prototype. The fans were properly spaced and were of the correct type for a phase I IC GP38-2. This view shows the delicateness of the see-through radiator fans and the proper chicken wire radiator grilles. Cab wind deflectors are included on the model, but this detail changed over the lifespan of these units. All the small printing such as, “ALWAYS BE CAREFUL” located on the front and rear pilots and “WATCH YOUR STEP,” is clearly legible and are in the proper locations on the pilots and the step wells. The small letter “F” located on the side sills denoting the front of the unit are somewhat of a mystery. Some prototype photos reveal this “F” should be a stamped steel circular plate, which is painted white. However, there were discrepancies between units showing some with a stenciled “F” and others with the round steel plate “F.” The model has the correct style of coupler cut levers, which are painted white in the proper places. The MU cover plate on the model is painted red, but photos reveal this should be black from what I observed on prototypes. The model is equipped with a proper low-profile snow plow on the front only and sunshades as per prototype on the side cab windows. The rear pilot is void of a plow, which is correct, and it has two spare knuckle holders with spare knuckles included. The nose headlight is correctly positioned within the nose, and the upper headlight area is accurately plated over. It is unclear when the upper headlight received modification on the prototype, but it is an accurate detail for the “new image” GP38-2 paint scheme. The grab irons, including the circular grab behind the rear radiator fan, are black. For this particular unit, all the grabs are black and, therefore, makes the model prototypical. I did find that some of the later “new image” repaints had white paint on the rungs of the grab irons. One missing detail that I did notice was the lack of a grab iron above the engineer’s side number board. The model also features a ratchet-style handbrake recessed into the fireman’s side of the short hood — another prototypical feature for all the IC 9600-series GP38-2s. The MRN sample Phase I IC GP38-2 had an interesting array of details located on the long hood. The bell-on-bracket appearing on the fireman’s side is done well with the bell and bracket attached to the side of the non-dynamic brake hatch area. It also includes the four-exhaust manifold detail with detailed bolt heads cast into the flat sections that attach to the roof. Overhead photos indicate that the model’s dynamic brake hatch should have four fold-up power assembly doors with its associated small hand holds, which mimic tiny grab irons. The model also lacks a few small triangular lifting lugs located in the center of the top of the carbody, which are used to lift the entire hatch during maintenance. For the discerning modeler, lines could be scribed in the non-dynamic hatch denoting the folding doors, and with a little patience, the lifting lugs and small handholds could be fashioned from wire. There are two correctly styled radiator fans in the proper place and spacing for a Phase I GP38-2. These fans are see-through and include fan blades inside the housing, which adds dimension depth and enhances the release’s appearance. After reviewing several photos of different units in this series, I believe the lift rings on the model may be a bit too large. They should be the smaller round lift rings found on most EMD “Dash 2” production models. The one extraordinary feature of the model is the attention to detail with the horn and antenna arrangement. 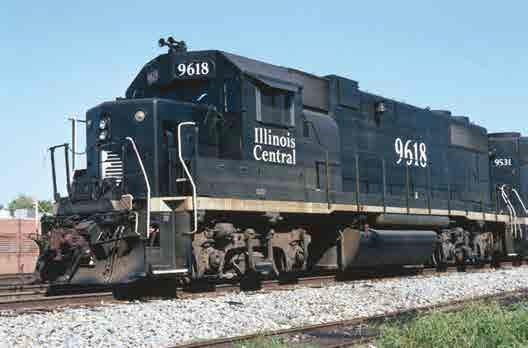 The prototype Illinois Central 9611 did have a five-chime Leslie RS5T air horn when it was repainted into the “new image” scheme in late 1989. The antenna style and placement is accurate with a short skate-type antenna to the right of the horn and a regular length skate type antenna on the middle/rear portion of the cab roof. Athearn has included front and rear ditch lights on this run of IC Phase I GP38-2s. The model also includes classification lights on the front and rear nose. After thorough research, it was determined that around 1993 the railroad began to plate over the classification lights. A few years later, the ditch lights were added to comply with an FRA mandate for all locomotives in U.S. mainline service to be equipped with ditch lights by 1998. In essence, if the model had ditch lights, it should not have class lights. The discerning modeler could detail the unit either way, depending on the era modeled. The ditch lights on the 9600-series GP38-2s were built inside an interesting semicircular casing that protruded just above the walkway deck. This detail is not present on the model because Athearn has used its standard model ditch lights that are common on other Genesis offerings. The model rides on the proper Blomberg type-M trucks with nice detail. The truck sanders on this model were not placed into the sander brackets on the lower portion of the truck journal frame, which allows them to hang in the air a little too high. This is an easy fix — the modeler can just bend the sanders down into the bracket. The 2,600-gallon fuel tank is prototypically correct for the IC’s 9600-series GP38-2s. The fuel tank and associated details are well done with a red filler cap and fuel sight glass. Another attention-to-detail attribute was the addition of red paint on the side sill to show the emergency fuel cut-off location just above the fuel filler cap. This Athearn Genesis model is equipped with a SoundTraxx Tsunami2 diesel sound decoder, which is an example of SoundTraxx’s newest decoder technology featuring DDE or Digital Dynamic Exhaust. The decoder itself is dual mode, which allows it to run in analog mode with a DC power pack or in DCC mode using a DCC system. I tested the model on my home layout, which has a Dixitrax Super Chief system. The decoder’s sound file is correct for the EMD IC 9600-series GP38-2s, which were built with a 645-series, non-turbocharged diesel engine. The sound decoder features several interesting sounds that are customizable by the modeler. Included in the box is a well laid out 8.5×11-inch Quick Start Guide and a booklet with a listing of sound and motor control CVs (control variables), which will have you up and running your new Genesis model in no time. When I tested the model, I customized a few of the sounds immediately. After I had powered up the unit, a low-oil alarm bell sounded and then the 645 prime mover roared to life. I changed the default address of “03” to the unit number “9611.” I had to do this using my programming track, which is connected to a Digitrax PTB 150 Programming Track Booster. The PTB 150 alleviated some issues I was having while trying to program some of the new SoundTraxx Tsunami2 decoders. The Tsunami2 uses more voltage than the older SoundTraxx decoders and, therefore, could not be programmed in OPS Mode, also known as “programming on the main” from my experience. So, the programming track with the new booster made this task simpler. On initial start-up, the sound was excellent and reminded me of the units I heard working in Springfield, Illinois, in the 1990s. The volume is very loud right out of the box, so I immediately referenced the operations booklet by turning to page 21 and accessed CV 128 (master volume control), lowering it to a value of 155, which is lower than the default factory CV setting of 230. One very positive feature of this model and its decoder is the default setting to cut the sound in half by pressing function key F9 on your controller. I also accessed CV 129 (horn volume) and lowered it to a setting of 230 from the default setting of 255. The horn detail installed on the Athearn Genesis IC 9611 is a Leslie RS5T, so I referenced CV 115 (horn type) and changed the CV value to the number 3, which was the correct sound CV for a Leslie RS5T horn. I did have an issue with the horn CV values listed on page 21 of the manual. The manual states that the user should access CV 115 (horn type) and then choose CV 3 for the Leslie RS5T horn. After several failed attempts to change the horn from the default setting, I referenced the SoundTraxx manual and found that I should be setting CV 120 to a value of 29. After this had been accomplished, I was getting the proper RS5T sound. The horn sounded excellent, and it reminded me of being trackside while photographing the IC GP38-2s some 25 years ago. I distinctly remember these horns did have a lapse in the sound as the engineer would pull back on the horn handle, creating a light sound at first and then ascending into a sharper pitch, depending on how much pressure was applied to the horn handle. You may want to play around with this as well to create a sound that is acceptable to your ear. The great thing about these sound decoders is that you can customize nearly every sound, from the horn to the exhaust to the volume and pitch of the air compressor. I cannot stress enough that you should take your time and methodically go through the sound CVs, tweaking the sounds until they match your tastes. There are so many sounds and settings for this decoder that I can’t begin to discuss them all in detail — that would make a book in and of itself. MRN’s sample model has the correct chicken wire radiator grilles and the correct style fans with the proper spacing for an EMD Phase I GP38-2. The spare knuckle holders on the pilot are prototypical, and they include rusty-colored knuckles. All IC 9600-series units had double jacking pads located above the trucks under the frame, which was a very nice detail on the model. This view shows the molded-on classification lights in the middle of the rear nose and the standard class-light knockout locations above the number board. This detail is common on EMD units of the era. The pilot has MU cables and a train-line air hose. The ditch lights are located on the upper portion of the pilot; however, they are not exact replicas of the IC’s ditch lights. MRN’s model ran excellent right out of the box. The default motor sound settings were pretty close to the prototype as I throttled up the unit. The speed and sound were in sync and seemed prototypical. Weighing in at 12.75 ounces, the unit is a great puller — it handled a 25-car coal train easily on straight and level track, as well as negotiated No. 6 and No. 4 switches gracefully during switching moves. Another nice default sound is the independent locomotive brake, which will be released when you stop and go, or stop and reverse direction. There is also some “cab chatter” sound that is interesting and a “talking defect detector,” which randomly plays while the locomotive was on the layout. Some people may think this is annoying, but I did like the cab chatter because it reminded me of shooting roster photos of prototype locomotives and hearing the Motorola radios crackle to life while standing nearby. You can modify the “cab chatter” and “talking defect detector” sounds to play at a very random rate or turn off the output of them completely. This is true of other sounds within the decoder that may not be realistic or wanted by the modeler. The McHenry scale head couplers are at the correct height, and the wheels were all in gauge according to my NMRA Mark IV standards gage. The headlights and ditch lights are the normal Athearn incandescent bulbs. Pressing F0 on your controller will turn on the headlights, which operate in conjunction with the direction of the locomotive. The ditch lights are turned on by pressing F5 for the front ditch lights or F6 for the rear ditch lights, and these also light up in conjunction with the unit’s direction. In my opinion, the incandescent bulbs seem dim when compared to small LEDs used by other manufacturers. Overall, I am very impressed by this Athearn Genesis HO-scale “new image” IC GP38-2 release. Except for a few missing details on the top of the long hood and a missing grab iron above the engineer’s number board, this is an excellent model that runs well and captures the prototype fidelity of the Illinois Central’s “Death Star” dress of the late 1980s. This “new image” IC GP38-2 would fit in nicely on any HO-scale railroad set in the mid-1990s hauling a local down the main line or leading hopper cars on one of Illinois Central’s numerous southern Illinois coal lines. I would like to thank Daniel Kohlberg for his assistance in answering questions and sharing photos of ICG/IC locomotives concerning the power assembly door details. This review appeared in the August 2017 issue of Model Railroad News.